Experience ultimate luxury here at our very own resort. Between your busy days exploring the town, take an afternoon off to treat yourself to a blissful day at our tranquil spa. With a number of services offered, The Spa at Riverview will whisk you away into the total relaxation you deserve—you are on vacation, after all. Here for a getaway with your loved one? 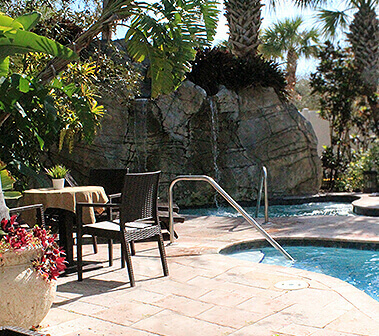 The Spa has a few couples treatments to choose from, one of which being the popular Couples Oasis Retreat: a 50-minute tandem massage, an aromatic hydrotherapy bath, and chilled champagne and chocolate to top it off. Going solo, treat yourself to facials, body treatments, or specialty massages including a Cranial Therapy to alleviate migraines, stress, and tension. We’re often so focused on helping everyone around us that we forget to treat ourselves—The Spa is here to remind you to put yourself first, even if just for a couple hours.